I am a professional Congressional nerd. No, really. My job is to know what is happening in Congress and to distill it every morning for Congressional staffers, and every week for hundreds of thousands of POPVOX users. I chat with staffers all-day long. I know what drives them crazy and what they really appreciate, and I know when something special happens on the Hill. This week something special happened, and millions of Americans were a part of it. Trouble is, you’re not getting the credit. This week, you’ve probably heard about the Office of Congressional Ethics (OCE). That, in itself, is a miracle, because c’mon, did you even know what the OCE was previously? 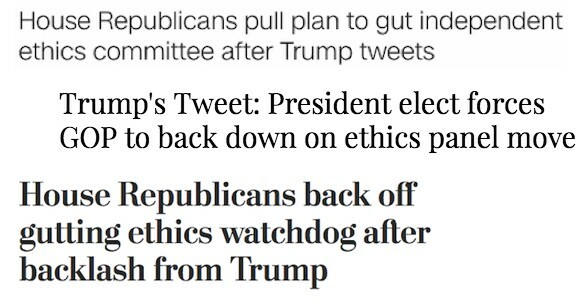 House Republicans approved an amendment to place the Office under the oversight of the House Ethics committee, eliminating its independence and restricting its jurisdiction. Then, the amendment was pulled from the House Rules package the very next day. So what caused House Republicans to reverse course and pull the amendment? Sure, any President-elect’s statements in opposition to an action are relevant and noteworthy. The trouble comes when news organizations give these comments full credit for an occurrence. It’s true the amendment was pulled after President-elect Donald Trump tweeted, but only in terms of chronological order, not that it was exclusive cause and effect. It is misleading to attribute the amendment’s removal to one thing in a headline, yet alone to write an entire article supporting that idea. Many media outlets largely ignored that House Republican leadership opposed the amendment. In fact, Speaker Paul Ryan and House Majority Leader Kevin McCarthy spoke in opposition to the amendment during the closed-door conference meeting — before the vote took place. POLITICO later revealed that the effort was led by House Judiciary Chair Bob Goodlatte and a group of lawmakers who “worked in secret for weeks, making sure word didn’t leak out to Democrats or the media.” The amendment was unveiled just before House Republicans met to approve the new rules package and passed 119–74. In the emergency meeting where the provision was pulled, House Majority Leader Kevin McCarthy spelled out an ultimatum — vote now on removing the Goodlatte amendment or he would offer an amendment to do so on the floor, bringing the fight into the public sphere. That my friends is a big deal and had a lot to do with the amendment being removed. This should also signal the immense value of public opinion. So what led House Republicans to the Capitol basement for an emergency meeting Tuesday morning, on the start of a new Congress no less? It was because members of Congress heard from their employer, or rather, employers, and they had to respond. This amendment passed late on Monday night, on a federal holiday where Congress wasn’t in session. No hearings, public debate, or media — not exactly peak paying attention time. After business hours on Monday, Daniel Schuman wrote a piece on what was happening, largely before most major news networks were covering the provision. The next day news organizations like POLITICO, ABC News, and The Washington Post quickly created explainers and highlighted the issue (because let’s get real, before this the OCE wasn’t something you had on your mind). Journalists educated the public on the duties and history of the OCE, and the possible implications of the proposed amendment. This gave constituents the information they needed to contact their representatives. I saw people on twitter like Emily Ellsworth posting phone numbers for lawmakers and offering best practices for contacting your member. Sunlight Foundation began tracking calls to Republican offices to determine the vote breakdown of the 119–74 conference meeting vote. Citizens to organizations (both liberal and conservative) activated people online, urging them to call their representatives. 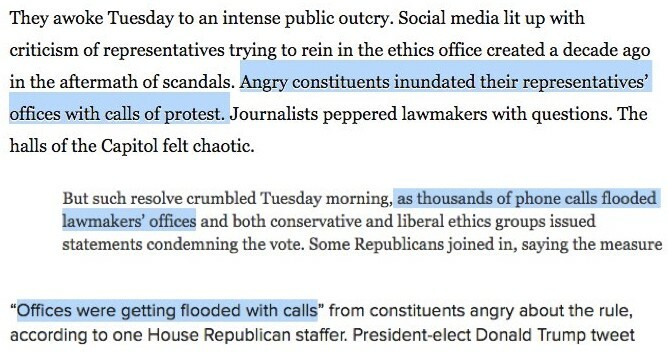 Congress received “thousands” of calls regarding an obscure office, and that’s important. 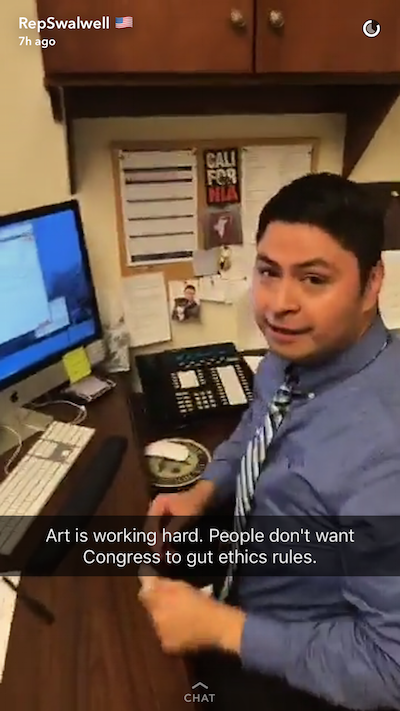 Rep. Eric Swalwell [D, CA-15] showed just how many calls his office was receiving on his Snapchat. I received several snaps from staffers in both House and Senate, Republican and Democratic offices showing their offices being bombarded with calls. ALL. Day. Well after the amendment was pulled from the Rules package. You see, it’s not enough to later publish articles saying perhaps it wasn’t all attributed to Trump’s tweets. Damage is done when journalists inject misleading headlines into the public’s consciousness. It ignores the immense value of constituent feedback and contributes to constituents’ mistaken belief that they cannot influence government. At POPVOX, we believe in connecting people and government and empowering effective participation, and this use case exemplifies why it’s still YOUR government and why you should be participating. If you want to ensure you know about the next big issue in Congress, sign up for our e-mails to stay connected to your federal and state lawmakers because yes, you do matter and your lawmakers want and need to hear from you. Disclaimer: This post does not offer any opinions regarding the actual Goodlatte amendment but instead seeks to highlight the sincere impact of constituent feedback. POPVOX is a neutral, nonpartisan civic engagement platform that meshes real-time legislative data with users’ personal stories in a format optimized for Congress.